Riley Morgan, age 14, has the drive and intelligence to take him places. 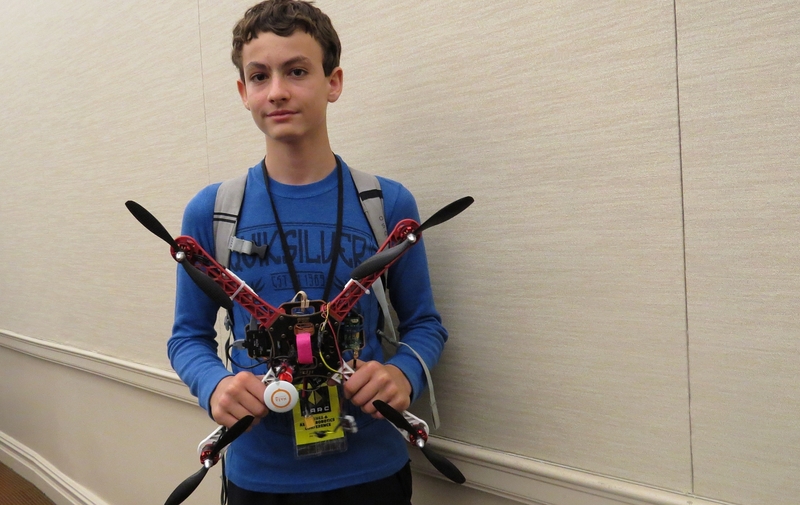 Most recently, it took him to the Drone & Aerial Robotics Conference, where he was the youngest attendee. He made quite a splash, getting to demonstrate his own quadcopter on the main stage. He also got to talk and exchange ideas with key attendees like Colin Guinn, Chief Innovations Officer at DJI, and Raphael “Trappy” Pirker, who is well known for his daring aerial videography. He made quite an impression for someone who just heard about the conference and decided he should go. Riley has always been a maker. He loved Lego as a kid, and made all kinds of creations. At age 10 he got his first Lego Mindstorms NXT set, and that opened up a whole world of building and programming robotics and electronics. Later at school he competed and did fairly well in FIRST Lego League, applying all he had learned to solve challenging tasks. Before the age of 13, he got interested in the online building game, Minecraft. Perhaps obsessed would be a better description. He built his own multi-player server, which he then migrated to a hosted server and began charging for access. The server became popular enough that he was able to make the $300 he needed to buy an Parrot AR.Drone 2.0. He dove into this new world of piloting drones with typical enthusiasm. It didn’t take too many flights (OK, crashes) before he broke his AR.Drone. He started looking for something more robust. 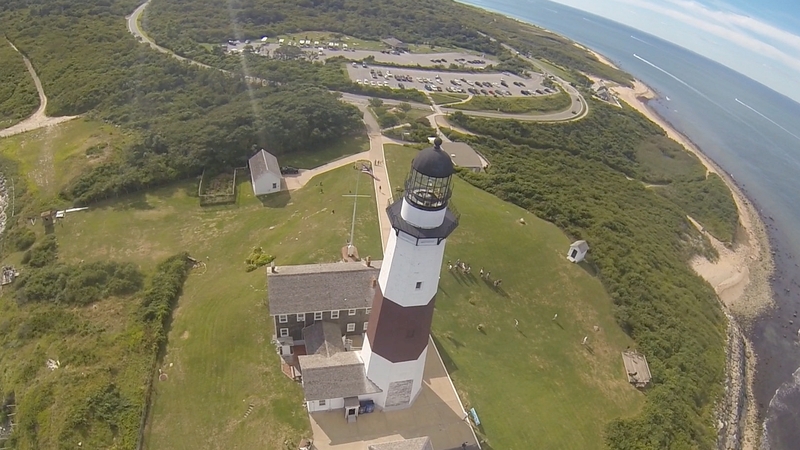 He bought a DJI Phantom quadcopter next, and kept upgrading. 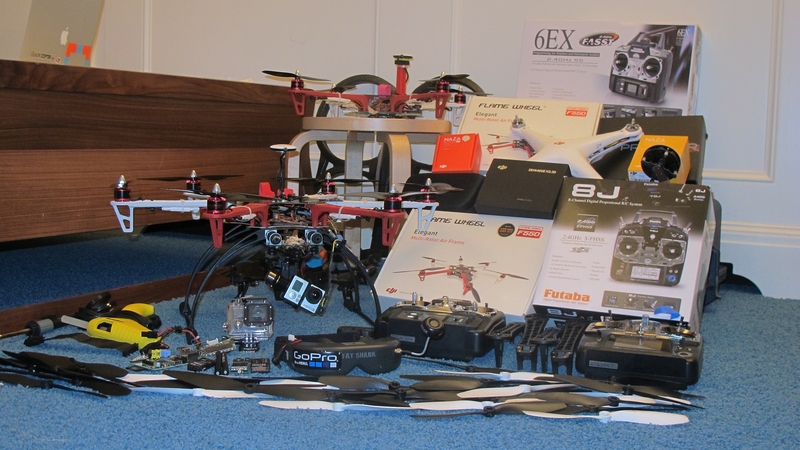 He eventually graduated from buying completed drones to building his own from DJI multicopter kits. He flew his multicopters all over, every chance he got. People started noticing, and stated asking him questions. Seeing an opportunity, he started a website, made his own business cards, and planned to sell his assembled drone kits. He actually only sold one. After hearing the widely publicized news of a man who killed himself with a RC helicopter, his father became concerned and made him shutdown sales. Undeterred, Riley now he offers aerial photography services through his website, Storm Multirotors. If you live in NYC area and are interested, check out his site and contact him. For his next adventure, Riley would like to create a weather-proof quadcopter to fly in the rain. He would equip it with a 3-axis gimbal mount for optical, infrared and night vision cameras. Perhaps even make it float for water landings. Riley hopes to approach local authorities to offer his services with this all-weather quadcopter. Whatever Riley sets his mind to next, I’m sure he will continue to make an impression. With his enterprising spirit, I wouldn’t be surprised if we hear more about this young man someday.